Ian Cathro is navigating his way through the first January transfer window of his managerial career. 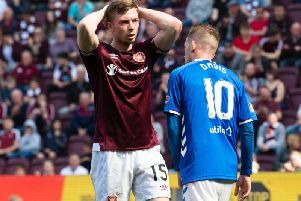 Hearts’ fortunes for the second half of the season depend heavily on his decisions, which is exactly what Britain’s youngest manager wants. The 30-year-old Dundonian served his time assisting coaches like Nuno Espirito Santo and Rafa Benitez. Now he gets to call the shots, negotiate with agents, sign some players and release others. Being Hearts head coach is a privileged position and one he worked long and hard to achieve. Cathro explained why his character and personality are more suited to making the critical decisions rather than helping someone else do so. “I genuinely don’t feel any massive difference or that my life has been shook up. The main difference is that, rather than having an opinion or thinking about a lot of things, I’m now making the decisions on all these things,” he said, speaking exclusively to the Evening News. “I feel that’s really the only difference. Rather than being involved in somebody else’s decision-making, it’s my decision-making. Learning about life at Tynecastle has consumed much of his time over the four weeks since he replaced Robbie Neilson. In particular, he had to find out about a largely new group of players. Results like the one at Dens Park two days before Christmas, when Hearts sacrificed a 2-0 lead in a harrowing 3-2 defeat, perversely helped Cathro’s learning process. “I’m somebody who thinks every single day whether something might have been better if we’d done X instead of Y. That’s a constant thing,” he admitted. “To this point, the things which haven’t gone so well were things we needed to happen in order to know. “When you’re new into a club with a new set of dynamics, there are little stories that you don’t know. There’s a lot things you need to try and understand quickly. In the early stages, you just don’t know what you don’t know until somebody tells you or it smacks you in the face. One win, one draw and three defeats wasn’t the start Cathro hoped for in management. He doesn’t shirk the issue and openly concedes that Hearts should have garnered more points from those fixtures. He is attempting to instil a more controlled style of play based around ball retention and is confident progress is being made, albeit it is results which ultimately matter. “I think there is some progress,” continued Cathro. “When I look from day zero until now, and look at the small steps we want to take to eventually have a way of playing which will make us stronger and more consistent, then there has been progress in that direction. Again, he willingly carries the can.